The dust has barely settled from his emotional win over interim title holder Shane Carwin this past Saturday at UFC 116, but it appears undisputed heavyweight champion Brock Lesnar may have already been assigned a return date. According to The Dayton Daily News, both champions were told prior to their highly anticipated showdown that – health permitting – the victor would likely headline UFC 119 inside the Conseco Fieldhouse in Indianapolis, Indiana on September 25th. As expected, UFC president Dana White and Lesnar were mum at the post-fight press conference when probed about the controversial wrestler’s return to action. Both opted to go with the “we gotta sit down and talk” spiel instead. 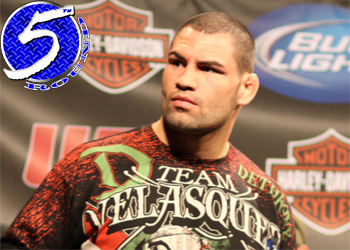 Cain Velasquez, who earned his top contender status by putting down Antonio Rodrigo Nogueira at UFC 110 in February, was sitting front and center to witness the heavyweight unification bout. Although, he was not brought inside the Octagon to hype Lesnar’s next title defense following the contest. Lensar became the world’s top heavyweight after his dramatic come-from-behind victory over Carwin inside the MGM Grand Garden Arena in Las Vegas. The submission win bumped his pro MMA record to a dominant 5-1. Despite having only six bouts under his undisputed title belt, half of his scraps have been of the championship variety. That percentage will surely increase after what Lesnar showcased at UFC 116, as the former WWE superstar appears to only be scratching the surface in regards to his reign.